The 35.05 metre motor yacht Sans Souci, jointly listed for sale by HMY Yacht Sales and Westport, has been sold with the buyer introduced by Jim McConville at Allied Marine. 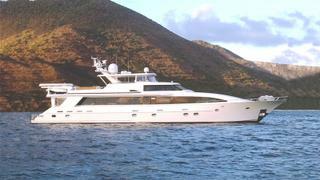 Sans Souci was built in GRP by Canadian yard Crescent Custom Yachts to a design by Jack Sarin. She was launched in 1996 and has been continuously upgraded since delivery, including the installation in 2010 of brand new Caterpillar C-32 ACERT diesel engines with extended warranties through to 2017, which may be extended to July 1, 2020. Ten guests are accommodated in five cabins. The master suite is located amidships on the lower deck and has a king size bed, vanity unit, settee, a walk-in wardrobe and full en suite bathroom facilities. Forward is a VIP suite with a queen size bed and en suite bathroom with shower. A double and two twins complete the accommodation and all cabins have flat screen television sets and full Wi-Fi internet access. The main deck saloon has a lounge area featuring a custom-made mahogany bar with two stools, a games table with seating for four guests and an entertainment centre including a 42-inch pop-up flatscreen television set with a stereo surround sound system. Sans Souci has a spacious aft deck offering al fresco dining for 10 guests with a full wet bar, fridge and ice maker, while the flybridge includes a large sun deck area with a Jacuzzi and barbecue. Her top speed is 20 knots and her power comes from two 1,900hp Caterpillar C-32 diesel engines. Sans Souci was asking $2,950,000.